The Corbett National Park is blessed with the natural bounty in the form of distinct flora which comprises of fresh water flora and alpine flora. Extent over an area of more than 521 square kilometers the Corbett has diverse floral count that is absolutely astonishing. The various habitat types of Corbett is occupied by Sal forests, Khair-Sisso forests, Mountains, Chaur, and rivers and streams that owes their distinct assemblage of plants. According to botanical survey of India Corbett has 600 species of plants - trees, shrubs, ferns, grass, climbers, herbs and bamboos. These many distinct varieties of plant kingdom makes the national park sought after wildlife destination for those who wish to relax from hectic schedule of working throughout the year. 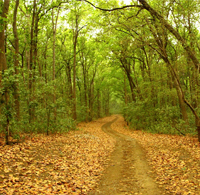 Being one of the richest home of wild animals, the Corbett National Park is rich in flora too. More than 75% of the total area of the Corbett is dominated by Sal forests. Corbett's floral diversity is mind boggling. In association with bhabar about 110 species of trees, 51 species of shrubs, 27 species of climbers and 33 species of bamboo and grass are found. The dominant species of tree is evergreen Sal (Shorea robusta) and its associate tress which is found over 75 % of the total area. In a few areas pure stands of sal are found. Trees like the Sheesam (Dalbergia sissoo), the Kanju (Holoptelea integrifolia)-trees which can be seen scattered liberally all around its ridges, the ber (Zizyphus mauritians), dhak (Butea monosperma), and bael (Aegle Marmelos). Besides these, other varieties of flora in Corbett include the occasional simal (Bombax cieba), jhingan (Lannea coromandelica) and khair (Acacia catechu) which bear flowers during summers just before the advent of the spring is found along the Ramganga river.